After receiving the results of the genetic genealogy test my maternal uncle took, I was excited to branch out and see if anyone else wanted to take a test. Being new to the genetic genealogy world, we wanted to have my grandmother take a test to see if the results matched those from the first test. With this in mind, we ordered a test through a different company. I had been seeing a lot of good things online about a company called 23andMe and so that was the company we selected for this test. The test that 23andMe uses not only calculates your ancestry breakdown, but also does a health breakdown that tells you what diseases you are at greater risk for and what traits are common in people with a similar genetic background. As I live a thousand miles away, my dear mother (aka Saint Marla) walked G-Ma through the test and dropped it in the mail. A couple months later I received an email stating that her results were in. While the nerdy science girl in me really wanted to dive into the health analysis, I headed over to the ancestry results page first. As expect, the results of this test confirmed the haplogroup results from our first test. 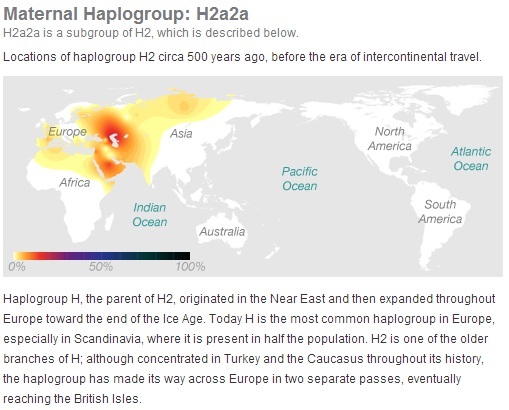 Grandma's maternal line clearly belongs to the H2 subgroup: H2a2a. The map for this test (click on the image to enlarge) looks a bit different from the first test and I found this one to much easier to understand. The next section I explored was her Ancestry Composition. The ancestry composition provides you with a percentage breakdown of your DNA in the 22 worldwide populations. This result combines both your maternal and paternal lines and reflects where your ancestors were roughly 500 years ago (before ocean-crossing ships and airplanes were available). 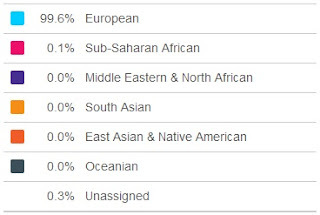 G-Ma's results showed that she is 99.6% European, 0.1% Sub-Saharan African, and 0.3% unassigned. Overall, these results accurately reflect my research and support the first test my maternal uncle had taken. I was a bit surprised that only 0.3% was unassigned, as I have heard higher numbers from others who have taken the test. At my grandmother's request, I have not shared the health risks with her or anyone else, and as a result, will not be blogging about them here. They are a different kind of personal and she didn't want to know about them. In her mind, she has lived a long life and doesn't need anything else to worry about. I respect and support her decision to not familiarize herself with this information. I love your site's look, especially the header! Nice and clean, easy to read and reminds me of genealogy research! Great name too! Enjoyed your DNA post! I hope to do some genetic testing myself this year. Continued good luck in your research! Thank's Cindy! We just got another test in the mail this morning that my husband is going to take. I love seeing the results of these test!